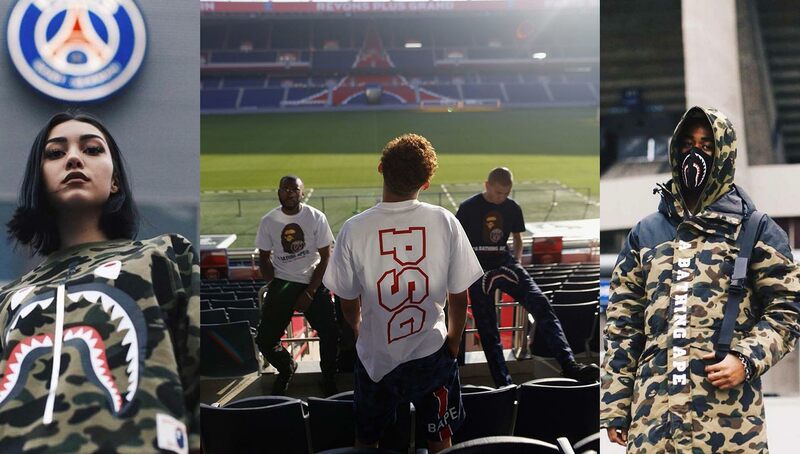 Set to debut this weekend, Paris Saint-Germain and BAPE have given us a sneak peek at their upcoming collection. Given the massively high-profile nature of this collaboration, can the PSG x BAPE line possibly live up to the expectations? It’s no secret — PSG is the most stylish club in all of football. While we’ve highlighted some of their best collaborations from vaunted brands and artists such as Coca-Cola, Air Jordan, and The Rolling Stones, in terms of streetwear, their biggest collab has yet to come. 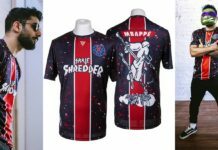 Partnering up with BAPE — one of the most hyped labels in street fashion today — PSG is set to drop a 13-piece collection that has club diehards and hypebeasts equally excited. 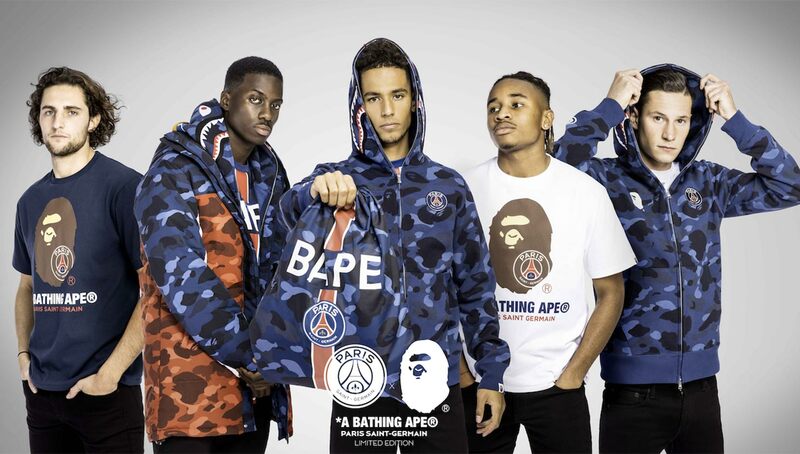 Included in the line is BAPE’s trademark full-zip hoodie complete with PSG’s crest and lettering, a tricolor-inspired camo print jacket, t-shirts, and a drawstring bag. It goes without saying, none of these will be in stores for long (unless you count price-hiked resell markets). Launched in 1993, BAPE has outlasted numerous ultra-hyped brands throughout its steady reign in the notoriously fickle fashion landscape. From its often bootlegged sneakers to its iconic camo print, BAPE has created a legacy through its innovative albeit occasionally derivative ideas. But with the partnership of two of the biggest names in their respective fields comes a daunting set of expectations. Can this collaboration possibly live up to them? The short answer — yes. There’s just something about the red, white, and blue BAPE camo that is so beautiful. Even items in a traditional camo colorway shine, a testament to BAPE’s design ingenuity. 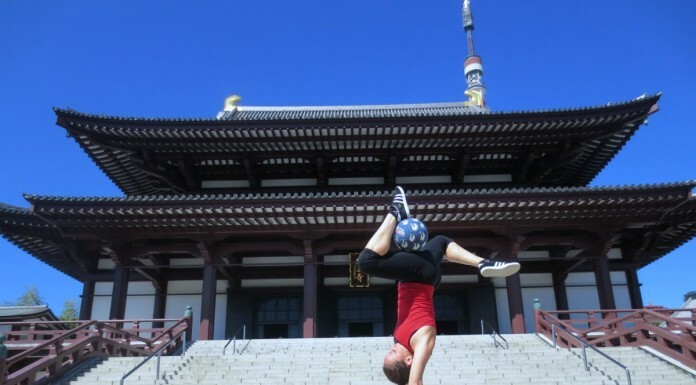 It seems as if PSG can’t miss when it comes to linking up with outside brands, and their position atop the throne of trendy football clubs continues to be safe. The collection will drop in ultra-limited numbers to celebrate the one-year anniversary of the BAPE store in Paris on December 1, with a release coming stateside in New York City and Los Angeles on December 8. 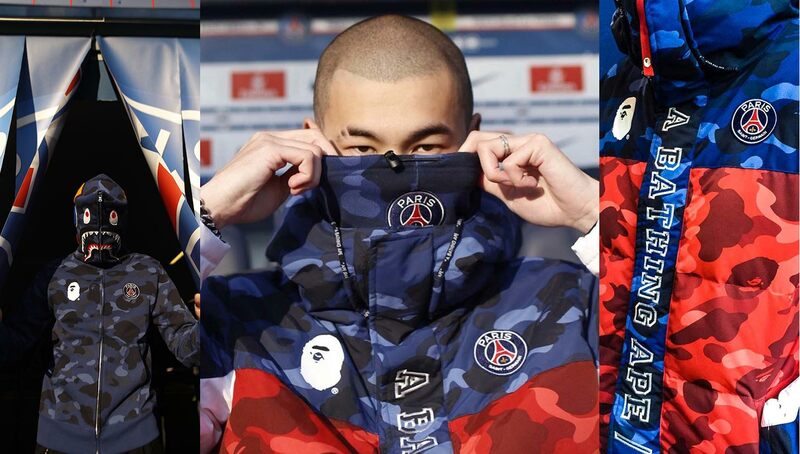 Do you think PSG has struck gold once again with its BAPE collaboration, or is this a case of pure hype? Sound off in the comments section below.